The surgery went very well, and I’m glad to be out of hospital so soon. As I entered the house again, my eyes fell greedily upon the latest edition of the British Archaeology magazine. An article that caught my eye in particular was the latest developments concerning the various excavations, and new modern scientific investigations analysis at the Upper Palaeolithic site of Gough’s Cave located in the Mendip Hills, Somerset, southern England. It has turned out that the cave has the earliest directly dated human skull cups. This was reported in the media a few months ago, but now an in-depth article has come out on the online PLoS ONE journal. The 2011 article, written by Silvia M. Bello, Simon A. Parfitt and Chris Stringer, can be found here and it is open access. Palaeogeography At The Time of use of Goughs Cave (Figure 1, Bello et al. 2011). Now, this is big news. 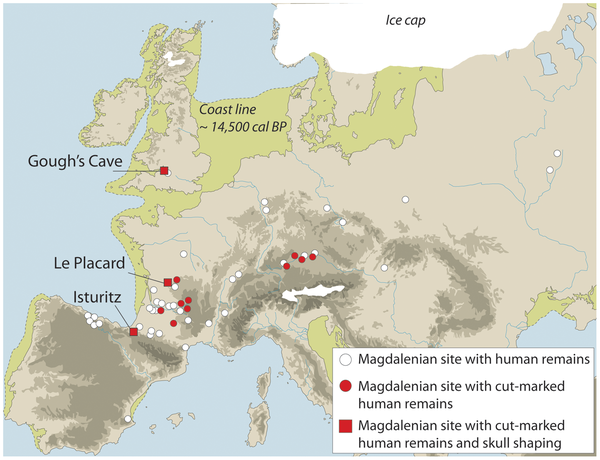 The site of the butchered animal and human remains is dated to the Magdalenian period of the Upper Palaeolithic, around 14,700 BP (BP simply stands for Before Present) during the end last of the glacial period (Last Glacial Maximum). The artefacts that have been found in this particular period at Gough’s Cave include flint tools, carved reindeer antler and mammoth ivory; a particular key find is the reindeer antler baton, a fine example of the craftmanship of the humans that used to live and roam this area. Now the finds we are most concerned with are the evidence of the defleshing of the human remains, and the very probably use of human skulls as drinking vessels. According to the articles stated above, the human remains were found with fauna including (in descending commonest order) wild horse, red deer, wolf, brown bear, lynx, saiga antelope, arctic fox and arctic hare (Stringer Et al, in BA magazine 2011:16). The animal remains showed evidence of butchery, in accordance with using the flesh for food. The co-mingled human remains, mostly cranial elements with post cranial elements also showed butchery marks, and do not seem to be deliberately buried. A selection of the human cranial elements found, highlighting the breaking and fracturing of the cranial elements during reshaping (Source: Natural History Museum). The remains subjected to new scientific analysis included 41 elements, 37 from skulls and the rest from mandibles (lower jaw). 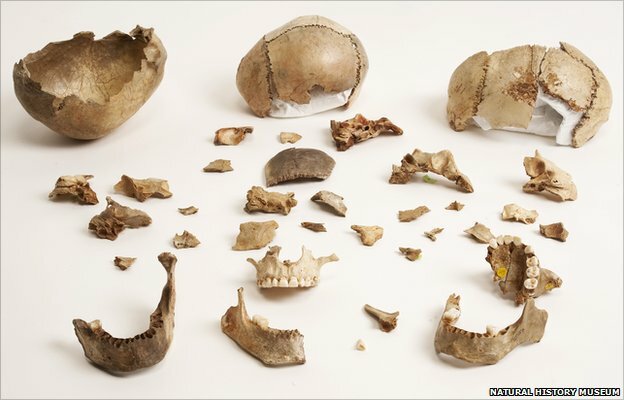 From the study of remains it has been suggested that they represent at least 5 individuals, including a young child, two adolescents, a young adult and an older adult (Stringer et al 2011: 19). There were three complete mandibles alongside three skulls caps present (see above). Although it had been suggested from earlier excavations, it is now thought that the bones did not suffer much from post-depositional effects (ie weathering or trampling). Many of the elements have evidence of stone cut marks; most were done by slicing, some chopping but signs of scraping were seen as rare. The skulls had less evidence of percussion marks whilst cut marks were particularly evident. Importantly they showed no sign of fire damage (such as colour changes or flaking) and all cuts are ectocranial (Bello et al 2011). Highlighting the main points of reshaping of the human crania (Figure 8 in Bello et al. 2011). 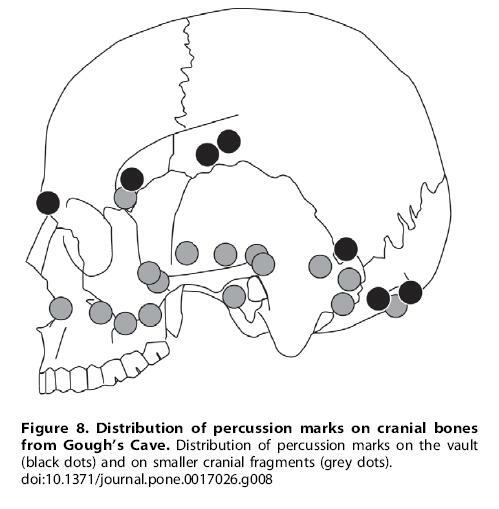 Carefully placed ectocranial percussion marks on the vault of the crania (Source: Natural History Museum). A) The head was detached from the body, probably whilst the body was either frozen or in the grip of rigor mortis. Cuts at the base of the skulls and on the cervical vertebrae indicate this took place shortly after death. B) The mandible was removed next, evidence is seen by post-mortem scratches on teeth of both mandible and maxilla alongside percussion fractures (Bello et al 2011). C) The major muscles of the skull were removed next (Temporalis & Masseter muscles in anatomical position) alongside the removal of the lips, ears, tongue, and the possible extraction of eyes and cheeks. D) Cut marks along the parietal and occipital elements indicate scalping as well. E) Finally, ‘the face and base of the skull was struck off with minimum damage to the vault, and the broken edges were chipped away to make the more regular’ (Stringer et al 2011). Evidence for cut marks on human bones in the Magdalenian period have also been found in the Rhine Valley in Germany, Dordogne area in France. Sites such as Le Placard in Charente & Isturitz in Oyrenees-Atlantiques (see above location map), both in France have evidence for similar skull modification and processing. Strikingly at Isturitz, one example even has carvings of animals in the skull elements. 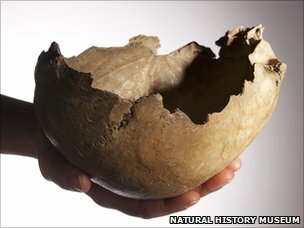 However, as pointed out in an earlier article on cannibalism, post cranial elements found (including metatarsals with evidence of being chewed by humans) are thought to be an example of ‘nutritional cannibalism’, even with the large amount of faunal remains co-mingled with the human remains. The slicing marks present on these post cranial elements are consistent with the striking of ‘green’ (fresh) bone. An interesting experimental archaeological test involved two researchers having their students chew fresh sheep and pig bones. This was carried out in order to test if the bite marks found were similar to bite marks on human metatarsal and radius elements found, amongst other bones (Fernandez-Javlo & Andrews 2011). The results helped to provide evidence that the chewing marks on the human bones (including a distal rib fragment) were probably caused by human teeth themselves. Rib chewing-archaeology style. In experimental tests archaeologists found that volunteers chewing ribs replicated the marks made on archaeological material human rib samples at Upper Palaeolithic sites (Fernandez- Jalvo & Peters 2011). As stated above, the skull elements was treated remarkably different with careful processes present. There was a distinctly high number of cut marks on the cranial elements present. Alongside this, a lack of trauma indicates that this is not for mutilation purposes, as seen at some American sites (Stringer et al 2011: 20/Larsen 1997). At sites where nutritional cannibalism has been documented, the skull is often fractured and broken in aiding access to the brain tissues within. At Gough’s cave, the skulls have been carefully prepared with flints and carefully processed. This hints at possible uses of the skull-caps as containers for liquids or holders for other objects. Ethnographic and historical sources have pointed to various cultures preparing and using human skulls as containers, war trophies or as libation instruments. Classically, Herodotus portrayed the Scythians as people who drank from the skulls of their enemies, whilst in ‘Buddhism human skull bowls have been used as libation vessels. In India, the use of skull cups seems to be still practiced by the Agori sub-sect’ (Stringer et all 2011: 20). Very interestingly, the article by Bello et al (2011) remarks that there are few archaeological finds for skull-caps, in consideration of the wide temporal and geographical spread of ethnographic and historical evidence. One example is the Neolithic site at Herxheim in Germany, previously discussed in a blog post by Kate Brown. In conclusion, the Gough’s Cave skulls-cups have been securely dated, and are the only ones found so far in the British Isles. The mystery still remains why they took part in this painstaking process. Bello, S. M. Parfitt, S. A. & Stringer, C. B. 2011. ‘Earliest Directly Dated Skull-Cups‘. PLoS ONE. (Open Access Article). Bones Don’t Lie. 2011. Cheddar’s Cranial Cups. Blog Site. Fernandez-Jalvo, Y. & Andrews, P. 2011. When Humans Chew Bones. Journal of Human Evolution. 60 (1): 117-123. Larsen, C. 1997. Bioarchaeology: Interpreting Behaviour From The Human Skeleton. Cambridge: Cambridge University Press. Stringer, C. B. et al. 2011. Gough’s Cave, Somerset. British Archaeology. May-June.